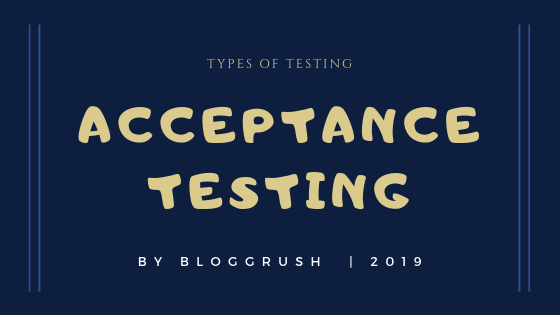 Acceptance Testing is also called User Acceptance Testing (UAT) and Business Acceptance Testing (BAT). Any Product we are purchasing today we firstly Cross verify And then Only we Accept that product. Otherwise, we Reject it. Example 1- Suppose You are Buying an Apartment. which you have seen in the advertisements. Now, will you Directly purchase by Watching the advertisement? NO, Right!! You, Will, Go and Crosscheck that Whether the Apartment is as I want or not. This is Basically called Acceptance Testing. Example 2- Suppose One Shopping Mart Want a billing Software. Till then the mart is having the manual billing system. now they want to upgrade the system. They Will give the Requirement to One of the Outsourcing Companie. Now When the Software is ready Definitely the customer will cross verify the software. If there is Alteration in that they will report that to the outsourcing Company. After fixing all the Alterations. Finally, the Product is ready to be used widely. In Acceptance Testing, few End Users will start using the software in Real business. For a particular period of time to find out does the software supports all the required business scenarios or Not. Now, what if the End User Don't know how to use the software or Internal IT Department is Small. In that Scenario, type two comes in picture. Testers of Development Companies will test the software at the client location based on the scenarios gathered from End Users. To find out does the software supports all the required business scenarios or Not. Now, what if the Client somehow can't Test at the Client location. In that Scenario, type three comes in picture. Testers of Development company will test the software at Development location Based on the Scenarios Gathered from End Users. To find out does the software supports all the required business scenarios or Not. Now, what if the Customer has a big IT department itself in their company. In that Scenario, type Four comes in picture. Testers of Client Companies will Test the Software at client Location Based on the scenarios gathered from end Users. To find out does the software supports all the required business scenarios or Not.